This is a new section which will in the future include memories from the past of Toy and Train Fairs and maybe some other snippets of events organised by Geoff and Linda. 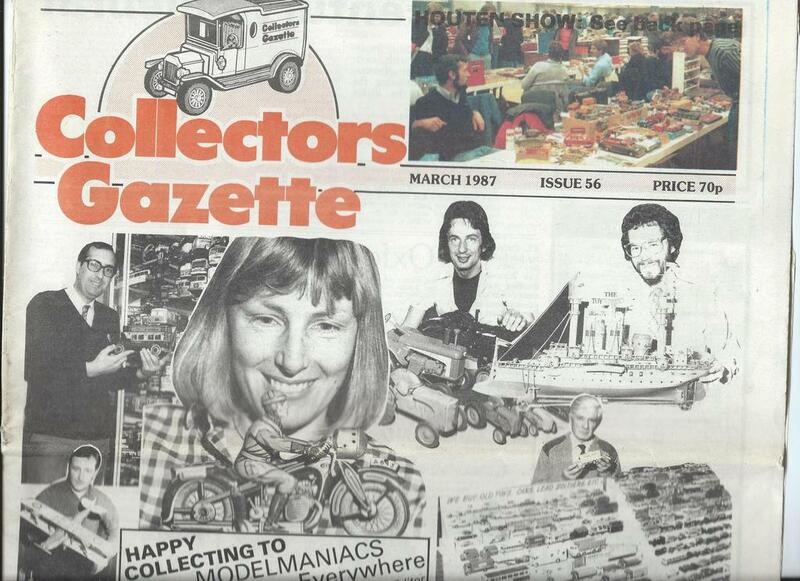 Geoff was pictured on the cover of Collectors Gazette March 1987 Issue 56 (30 years ago) His collection at this time was around 2,950 models – it has now grown over the years and the total is approaching 14,000. March 1987 also celebrated the 10th Annual Sandwell Historic Vehicle Parade in the May which included an annual Toy Fair organised by Geoff and Linda. 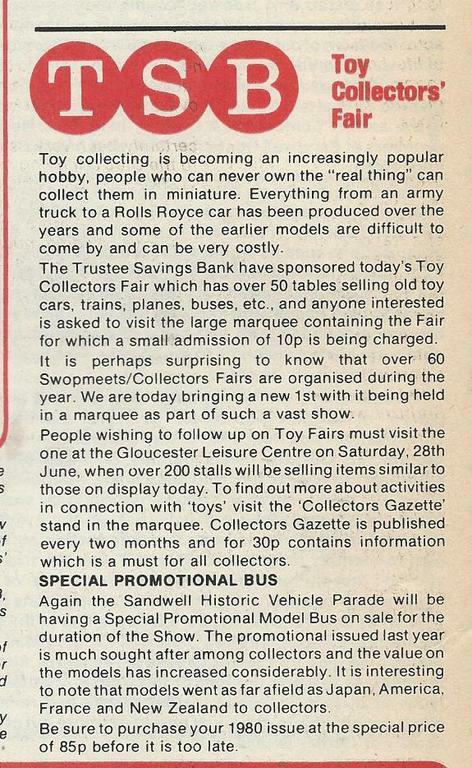 (The Vehicle Parade and Show started in May 1978) Also around that time other local toy fairs had started including: Kinver and Solihull and by 1987 the collectors fairs were starting to appear in large numbers across the country on Saturdays, Sundays and evenings during the week. The Midlands included Stourbridge, Coventry, Tamworth, Hockley Heath Solihull, Sutton Coldfield, Birmingham, Wolverhampton and many more. 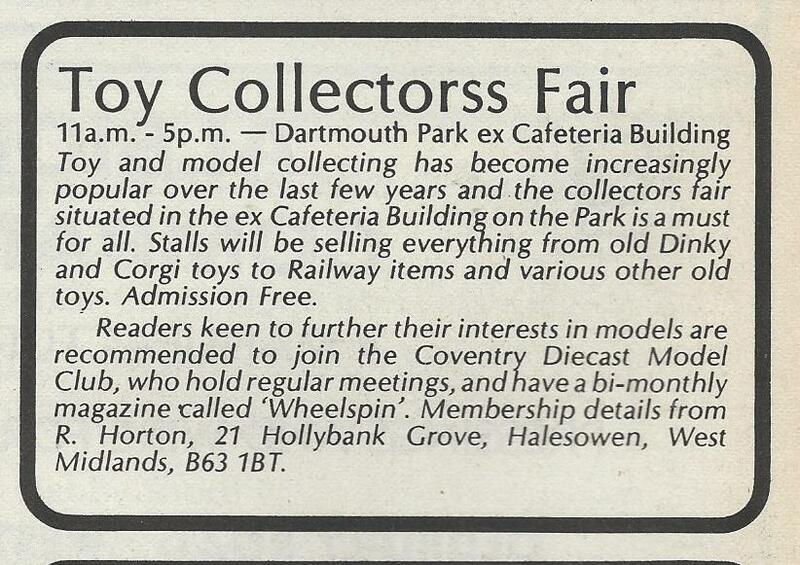 The first Toy Fair Geoff and Linda organised was as part of the Sandwell Historic Vehicle Parade and Show in 1979 which took place in the Dartmouth Park ex Cafeteria Building (now long gone) and at that time the admission was free. The following year in 1980 it moved into a large marquee and was sponsored by the TSB (Trustee Savings Bank), it had 50 stalls and a 10p admission – Oh for the good old days!! 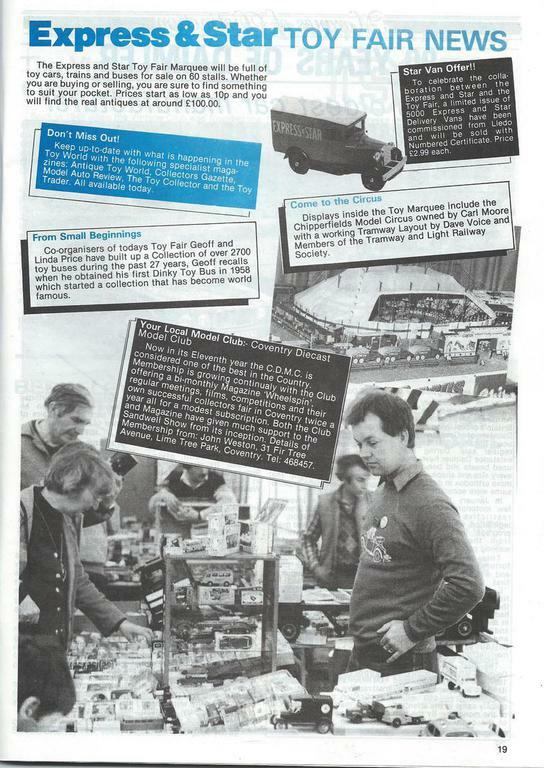 This Toy Fair grew to be in a much larger marquee and was a popular aspect of the show for the ensuing 30 years. Memories for lots of traders and the thousands of public who visited it. The Sandwell Vehicle event for many years attracted between 50,000 to 80,000 visitors with its main show admission being free and the toy fair averaged around 3,000-4,000 in the marquee throughout the day.